Posted by Equestrian Australia on 26/10/2013. Equestrian Australia Chairman Dr Warwick Vale announced at the EA AGM that current CEO Grant Baldock has been reappointed through to 2016. Dr Vale said the EA Board was delighted to have signed Mr Baldock for an additional term that would allow him to continue to oversee the organisation right through to the Rio Olympic/Paralympic Games in 2016. 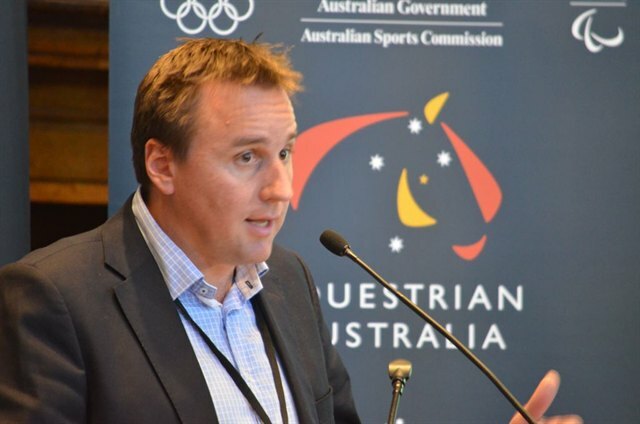 “Grant has bought about strong, positive change for EA that included securing additional Government funding, increasing our sponsorship revenue, introduced the Equestrian Grand Final, implemented a new junior participation program, delivered a partnership with Pony Club Australia as well implemented significant reviews. “Today we were able to showcase positive results against our strategic plan including bringing the EA financials back into the green, with more than $200,000 surplus recorded in 2012-2013. “It was a busy year with the London Olympic/Paralympic Games, with two reviews post London carried out and the recommendations now forming part of the High Performance Plans for the 2016 Olympic/Paralympic cycle. “Perhaps the most significant change to happen to the sport in the last 12 months was the introduction of a new national membership structure across all states, that now brings the equestrian membership categories under one banner. “More recently the Board and EA management worked with the States to implement a temporary solution for the online database introducing EA Online. The Board recognised the challenges equnect presented and have put the system on hold while the long term strategy for IT is further developed,” he said. Mr Baldock acknowledged that the last three years saw a lot of change implemented for the sport, while it hasn’t been without some setbacks, the outlook for the sport is nothing but positive. “We have laid a solid foundation in the last three years that I believe is going to produce significant success and growth for the sport as we commence the next Olympic/Paralympic cycle. “The resolve from the EA Board, National Office and State Branches to bring about national initiatives including the new membership structure and participation programs such as Ready Set Trot, we believe has the potential to grow the equestrian base year on year. “From an elite team perspective, we have laid out ambitious targets for both the 2014 World Equestrian Games and 2016 Rio Olympics as part of our Winning Edge strategy, and we believe we have the processes and personnel on board to work with our riders and owners to achieve those targets. “We want to build on the success of the Equestrian Grand Final and our new sponsorship programs to attract more corporates to EA and look at additional ways to raise revenue that will allow us to better support our Clubs and events right around the country,” he said. Dr Vale and Mr Baldock today presented the 2012-2013 Equestrian Australia Annual Report to the shareholders, the State Branches, at the AGM held in Sydney.